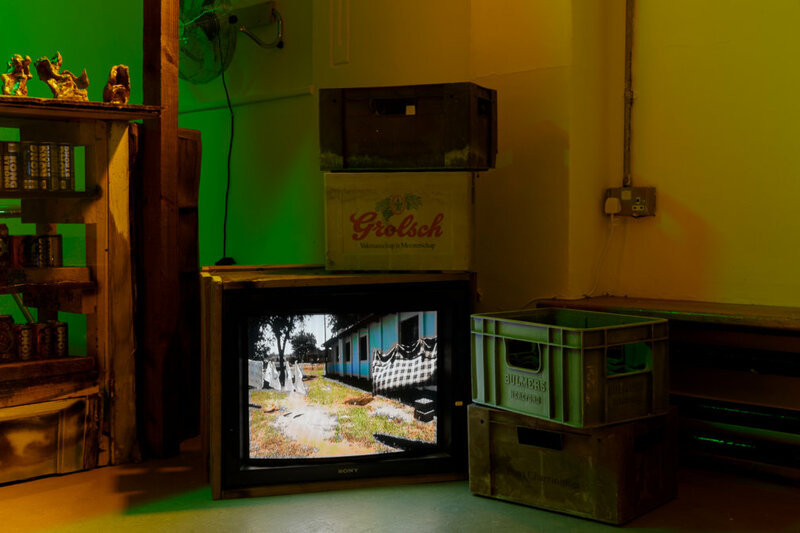 Entering London-based artist Tamu Nkiwane’s new exhibition at the Zabludowicz Collection, entitled Blue Plastic, viewers step into an emerald-tinted world filled with what appears to be a small convenience store, strewn with personal belongings. 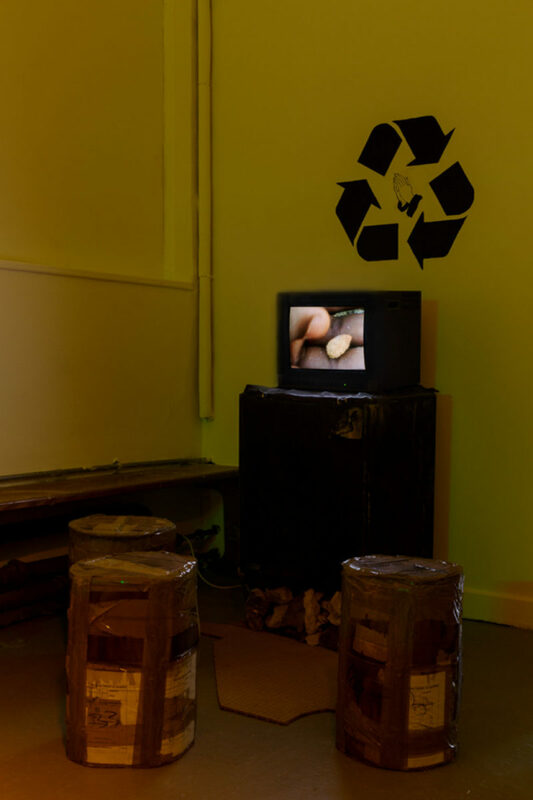 This intimate space is permeated with crumpled plastic carrier bags and battered plastic crates, giving the atmosphere of a rudimentary shop, as an old TV in the corner plays short video clips shot by Nkiwane during his time in Zimbabwe. 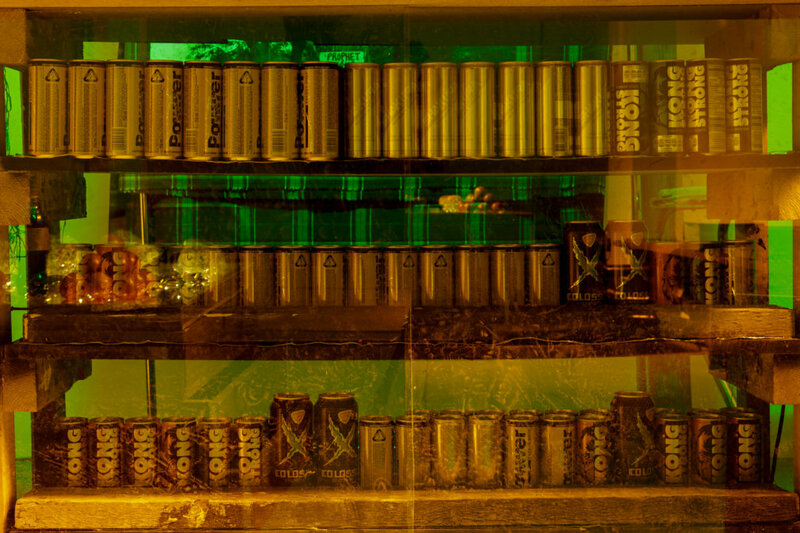 The exhibition features sculptures that reference temporary street market stalls, with displays of scattered dried fruit, rows of beer and energy drinks cans, as well as posters of Evangelical pastors. In the spring of 2018, Nkiwane, a graduate from London’s Royal College of Art, began his four-month trip to Zimbabwe and South Africa, centered around his Grandfather’s 90th Birthday celebrations. Nkiwane had never met his grandfather in person before, but he was a prominent figure in the revolutionary struggle of the 1960’s and 70’s against minority white rule, when the country was known as Rhodesia. Nkiwane arrived in Zimbabwe only a few months after the resignation of President Robert Mugabe, and found a complex situation where a new process of change was happening, but established political figures and structures still prevailed. With an economy out of cash and where daily commerce is conducted via digital currency on mobile accounts, Nkiwane was drawn to the objects and rituals of everyday trade, specifically places of exchange and approaches for displaying goods. “I got to see two worlds as well, as some people in Zimbabwe are comfortably off, like my auntie and uncle, who are professors. Everything there seems to do with title. If you’re a professor, then everyone loves you. I found that very conservative, and that’s the bit that shocked me: the sense of rigid hierarchy. After the liberation of 1980, a lot of the black people in Zimbabwe moved to where the white people used to live. They re-enacted the same rigid social hierarchy. For example, my uncle often told me to stop playing with the street kids who lived near the National Gallery. I was wondering why the Mugabe dictatorship happened, and I think one reason is because the Zimbabwean people respect that hierarchy – if you are power, you are essentially like a king,” Nkiwane explains. Throughout the gallery space, viewers can read poems and prose written by Nkiwane. His work is printed on booklets with photographic illustrations on newsprint, lining the walls around the room. Also on show are improvised musical sketches that the artist made during his travels, and in London, encouraging diverse and multisensory interactions with the work. 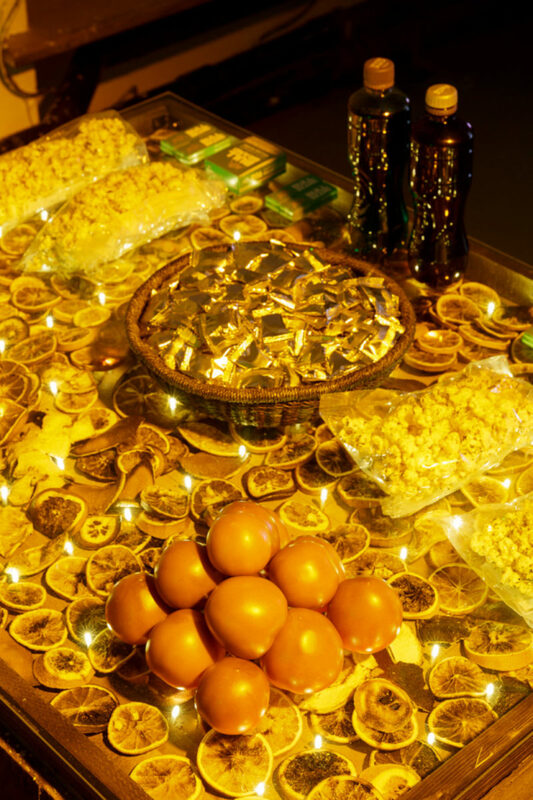 One of the most intriguing elements of the exhibit is a sculpture entitled Plateau II, comprising a large table displaying dried and fresh fruit, a woven basket full of gold butter packets, rolling papers, plastic bags of popcorn, and bottled drinks. “I was trying to get the rhythm of my experiences. That’s why the market stall made sense, because I think you can see an aspect of Zimbabwe in it, but actually it’s even more a reflection of me in that state of mind, of putting something up and taking it down. I put up a mental image when I was in Zimbabwe and then I took it down. And now I’m putting it back up in London with the information I gained from my time there. That’s how it feels,” Nkiwane tells. Tamu Nkiwane’s Blue Plastic is open until 16 December 2018 at Zabludowicz Collection.